This Friday, the theme of the weekly photo sharing event on Twitter is ‘rooftops’. Normally I don’t get the chance to take photos of rooftops, as getting to the top of the nearest man-made structure such as an iron tower in Paris, or a big wheel in London doesn’t really appeal to me. That is not to say that there haven’t been occasions that I have been tempted to get up above the rooftops and others the natural terrain gave me a view of rooftops that appealed to my eye, leading me to to record the view for posterity. When I searched my photo collection I found numerous examples of rooftops. Here are a few of those photos, along with the reason I was looking out over rooftops. Starting close to home in North Wales; I captured this while walking around Conwy town walls. I was exploring and trying to see how much of the walls remain open to walkers. As it turns out, most of the walls are accessible. 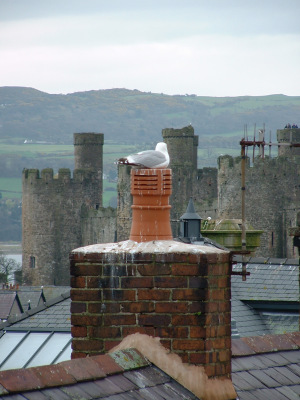 This seagull against a backdrop of Conwy Castle caught my eye. Next up, is a view over Manchester Museum towards Salford. I was working on a construction site at the time that was using two tower cranes. After spending the first half of my career underground in the coal mines, I know found myself having the need to climb all sorts of temporary scaffolding structures in the course of my inspections and at first was petrified. I found the solution to my fear was to expose myself to more and more work at height in order to desensitise myself. Climbing tower cranes on a day when an East wind is blowing in from the Pennines, blasting your hands with icy rain, while making the top of the crane sway like the mast of a sailing ship showed me where the term ‘white knuckles’ comes from. The weather the day this was taken was pleasant enough though. Overseas now to Italy for a classic rooftop view in Florence, Tuscany. I do have some of Paris but from Butte Montmartre not the Eiffel tower. Sadly the light and pollution that day meant washed out, photos. 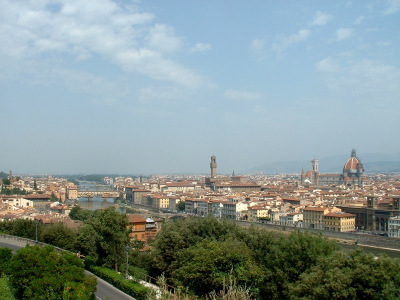 At Florence, we were staying at a in a tent with a real bed on the campsite overlooking the city. The view from the tent was obscured by olive trees but we did get glimpses of the Duomo etc. This is the view on our walk into town. The next view is from the Torre Guinigi in Lucca, Italy. When I saw the tower with trees on top I could hardly believe my eyes. I just had to climb to the top to see how this feat was achieved. This is the view when I got there. Now off to Germany. 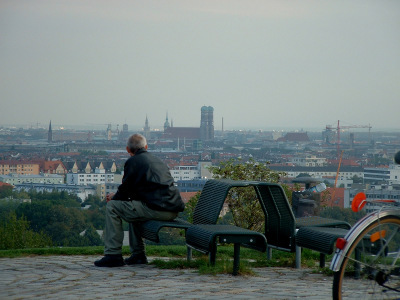 Munich was heavily bombed in World War Two. When it was rebuilt after the war the problem of what to do with all of the rubble arose. A simple solution was adopted. It was all carted out from the city centre and dumped. The result was a massive man-made hill that is now part of the Olympic Park. 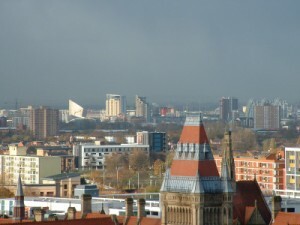 This is the view from the top towards the city centre. It also affords some breathtaking views over the Olympic Stadia and the BMW factory and HQ. The Czech Republic has some beautiful roofline vistas. Prague has some excellent vantage points to see the city of spires the castle, and Vitkov Hill are two of the better ones. But as I can’t fit fifty photos in one post. 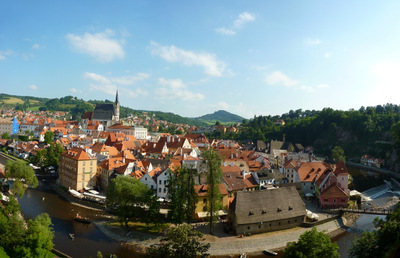 Instead I’m including a view from UNESCO listed Cesky Krumlow. This one captures some of the beauty of the place, but like all travel you have to visit to truly appreciate it. need to climb anywhere to see some stunning rooftop scenery. 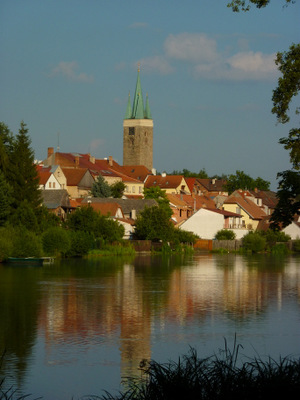 Telc in the Czech Republic is another UNESCO listed town. The topography of the area is very flat but the rooftops are clearly majestic. 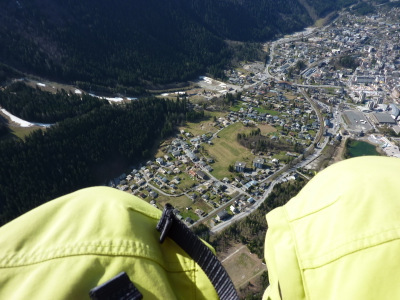 Then sometimes you can’t help but see rooftops, like the time I took a tandem paraglider flight from Planpraz, above Chamonix. I think I’m getting over my fear of heights now. There is another reason I might be high up in a building overlooking a city. The bar could be there! 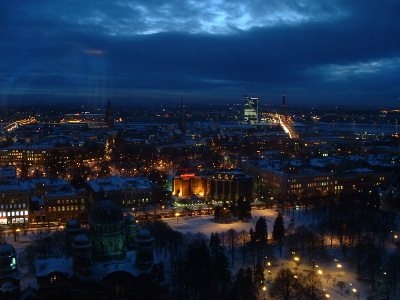 This is a view from the toilet of the Skyline Bar of the Park Inn Hotel in Riga. To finish, I leave you two photos featuring rooftops the way I love to see them; with over a metre of snow stacked up on them. 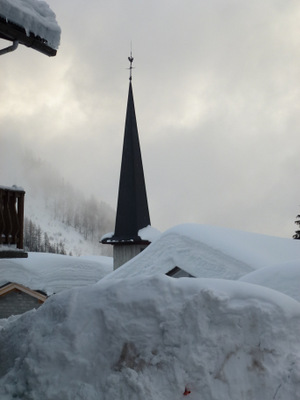 The first photo is of the rooftops of Le Tour at Chamonix from last winter. Incredible! 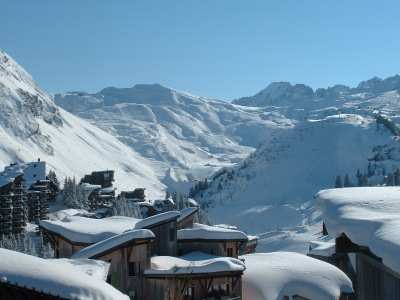 Then finally one showing Avoriaz in the Portes du Soliel area. The buildings are designed to mirror the mountains that surround the resort.